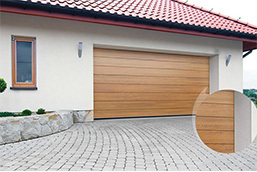 Sectional garage doors combine the modern design and facility of use. They are recommended not only to newly-built objects but also to people who renovate garage objects. 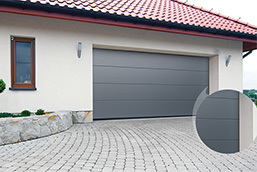 Comparing to tilt or turn functioning door, sectional garage doors ensure the optimal space use in every garage. We pay special attention to the precision of each element which effects in the perfect quality products. 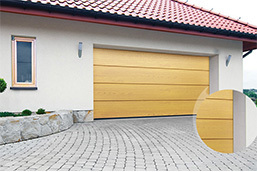 See the whole offer of DK-PROF sectional garage door which fulfils the highest exectations of customers. High-moulded panel DK-WPP is a modern and desired type of panel, with the discreet horizontal moulding. The horizontal moulding of panel DK-PP gives the light character to the door and elevation. The modern and dynamic outlook of door is stressed by visible mouldings. 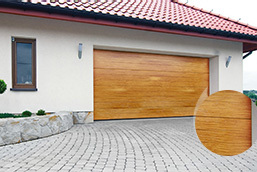 The choice of veneered panel in the garage door DK-OP gives you the possibility to adjust it to the style and character of a building.